Today we are here with a nice and interesting trick. We hope after read this you’ll like it. Today our trick is How To Set Your Facebook Account Memorializing After Death. So at first we need to know something about this trick. What is Memorializing Account After Death ? Facebook launched a a new process that you can memorializing your Facebook account after your death. It means you can set your account memorialize by choosing one of your friends who will post on your account wall after your death. This is a very interesting thing. Your profile will memorialize ever. There is one more thing that is you can set your account deletion after your death. We posted and you can read that trick by simply click here. This is depend on our choices. Naturally our choices are different. Some people want to memorialize their Facebook account after their death. On the other hand many of us want to delete their account after their death. That’s why we are sharing two trick that you can choose easily want you want. Now let’s know how can we do this. 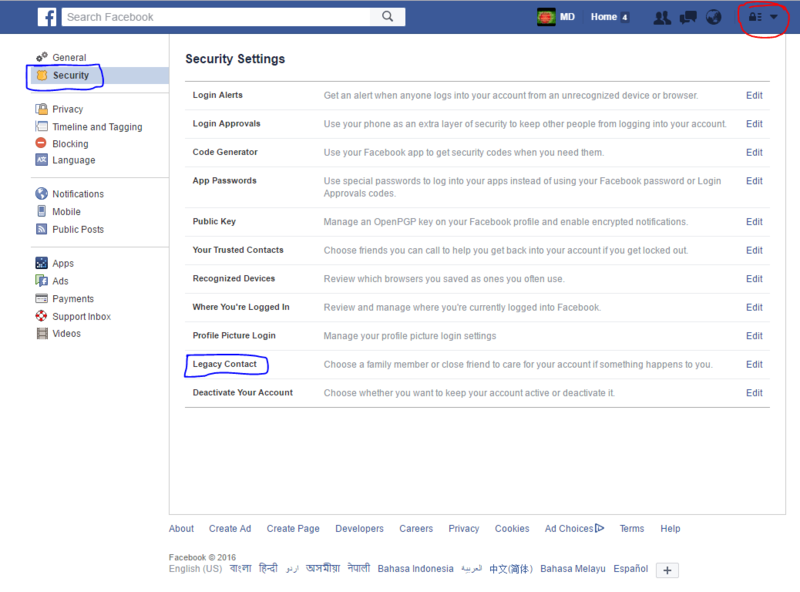 First of all you need to go you Facebook Settings and then select Security. Here you can see a option at the last Legacy Contact. We are giving this part by part that you can get it very easily. Click the last option Legacy Contact. Now you need to choose a friend who will post on your Facebook Wall after your death. Now after your death, your legacy contact would be able to set it to memorialize which could be only done after any of your friends on facebook requests for the memorialize of yours. Facebook Will do this automatically after when your friends requests for the memorialize of yours. After all of this your account will be memorialize and your friends will be able to see your pictures, status etc. Now you know one of the cool trick about facebook. Hope you like this trick. If you like this trick then comment us. You can share this trick with your friends and family. You can surprise them about it. You can find here many trick that really be helpful to you. You don’t know what will help you in your future. Till our new trick be well.